This particular road was the one I came down the other night and it was pouring with rain and lightning and thunder were all around. 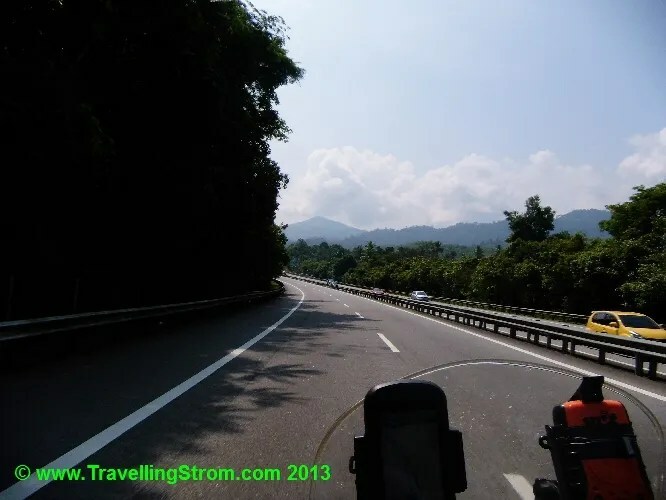 It was a pleasure to re-ride it in more comfortable conditions 🙂 I crossed the Perak River along the way and there was a massive rest area, and in this area were 3 caches but as I could not be sure of the security of my bike gear, I decided not to attempt these. It would have meant parking up and walking a km or so out of sight so I could not be bothered. 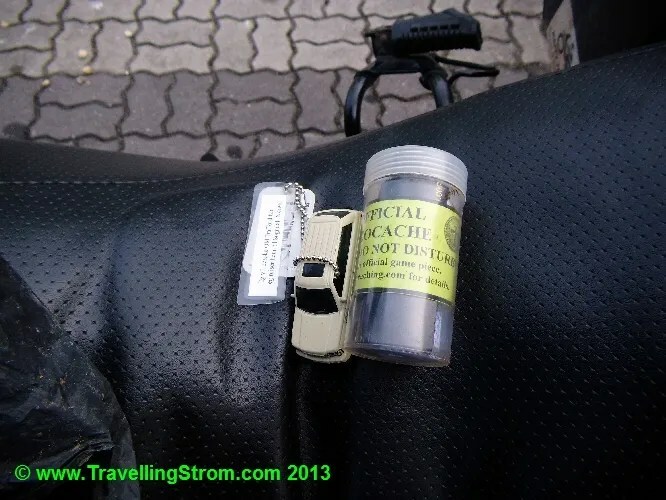 Anyway, I arrived in the royal town around 0930 and I was soon parked across the road from the location of the first cache of the day. 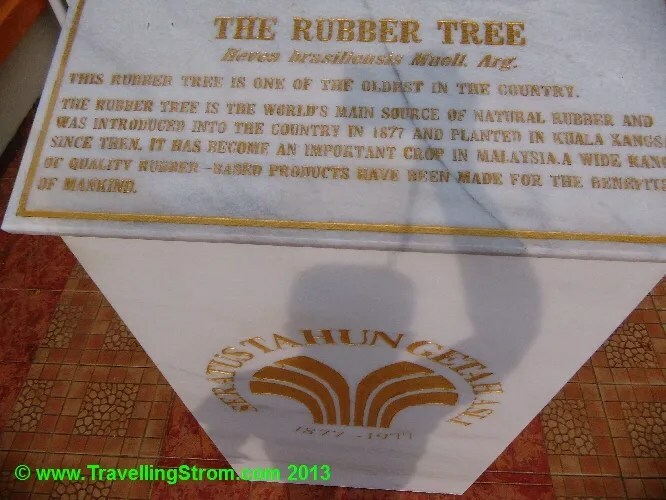 Rubber was introduced to the country in 1877 when H.N. 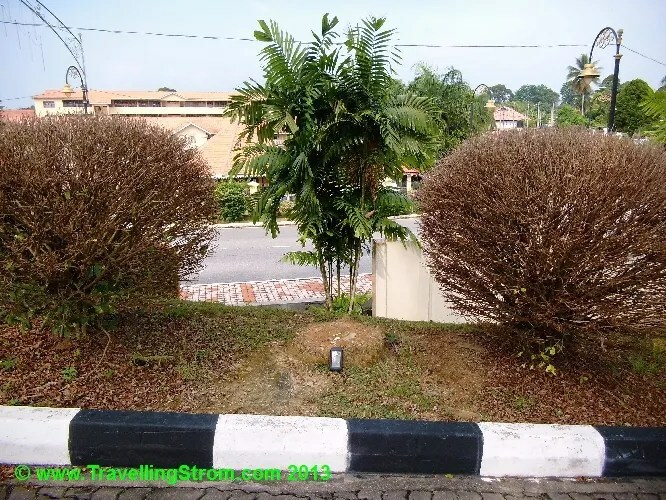 Ridley planted nine trees in Kuala Kangsar. 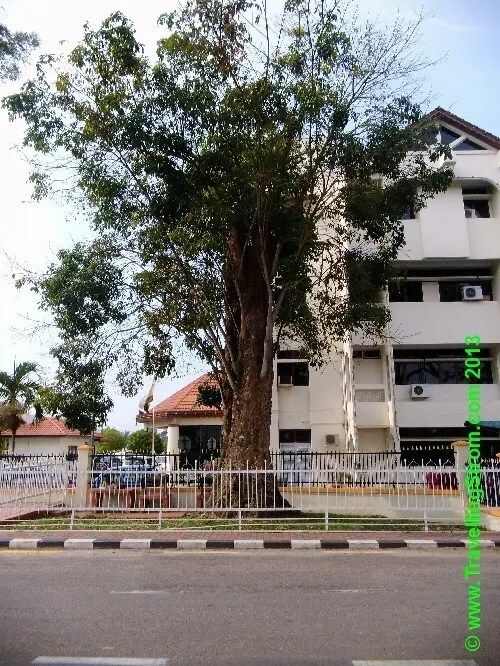 Just in front of the Kuala Kangsar District Office at the intersection of Jalan Tun Abdul Razak and Jalan Raja Chulan stands an imposing, old rubber tree. 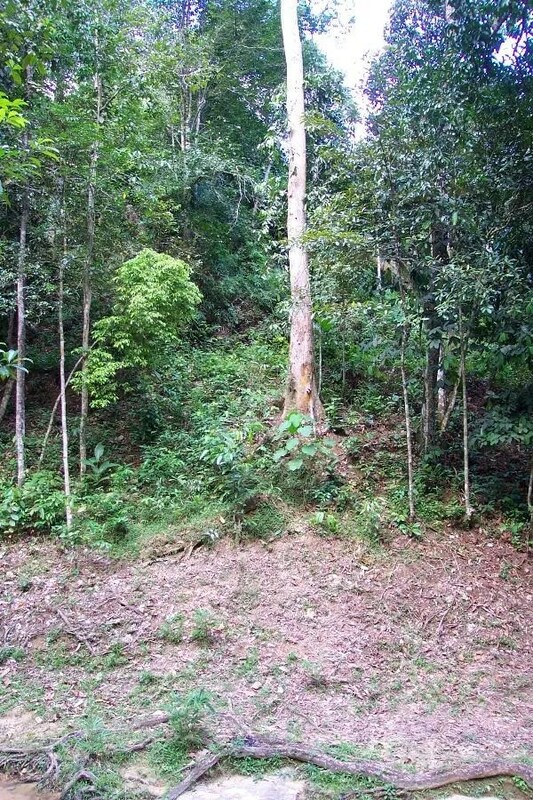 Believed to be the oldest rubber tree in Malaysia , it was an offshoot of the original nine. 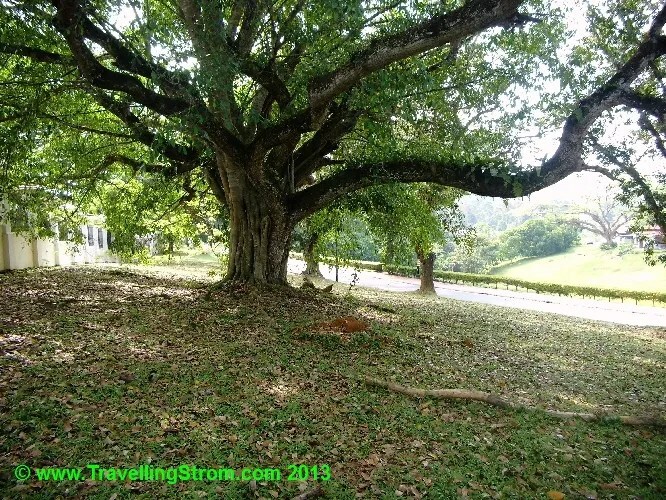 This century-old tree is still producing! Cache is a small cylindrical screw-capped transparent plastic bottle wrapped in black polyethylene bag for protection against the elements. BYOP to log your visit. Cache is located about 2 meters from ground level stashed in a hollow of a tree. It is readily visible if you know how to look for it. Please watch out for muggles. Kuala Kangsar’s crowning glory the Ubudiah Mosque at Bukit Chandan is reputedly among the most beautiful mosques in the country. 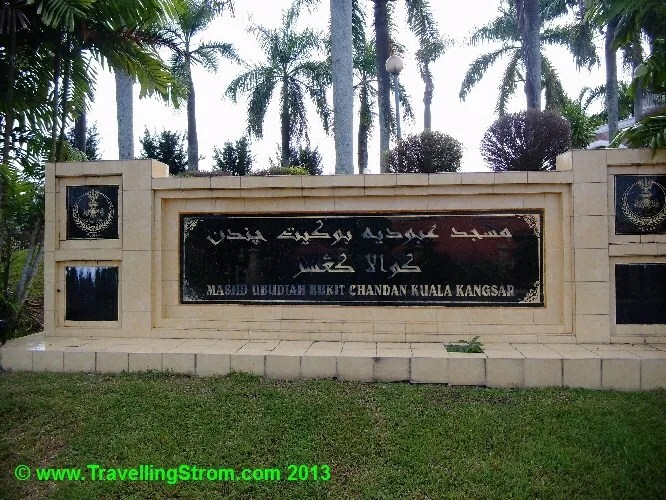 Construction began at the turn of the century under the commission of Sultan Idris Murshidul Adzam Shah I, the 28th Sultan of Perak. 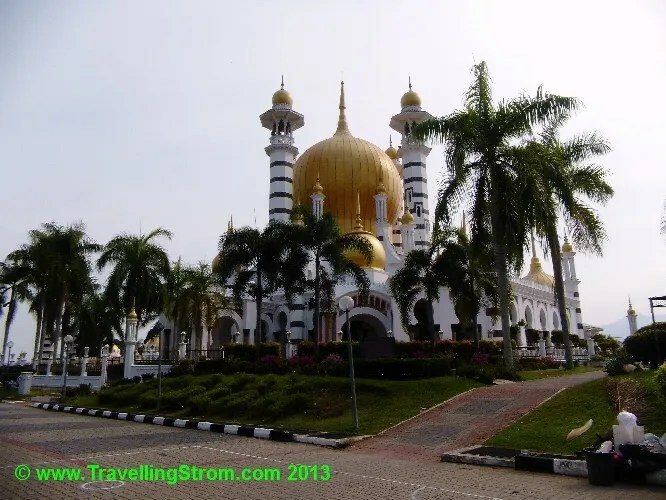 Its magnificent golden domes and minarets are hallmarks of classical Islamic architecture. An interesting fact is that elephants actually damaged the Italian marble flooring twice during the First World War. Cache is a small cylindrical screw-capped transparent plastic bottle wrapped in black polyethylene bag for protection against the elements. It is placed at base and in a Macarthur palm. 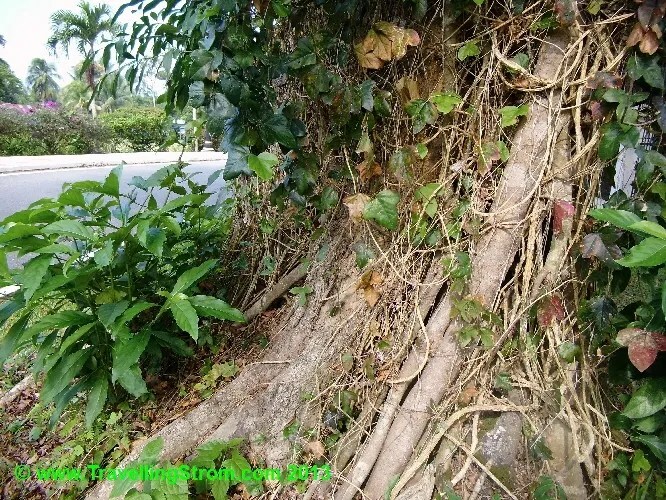 The GZ for this cache was right on top of the palm tree stump so it did not look too good. That is my GPS resting against the stump. 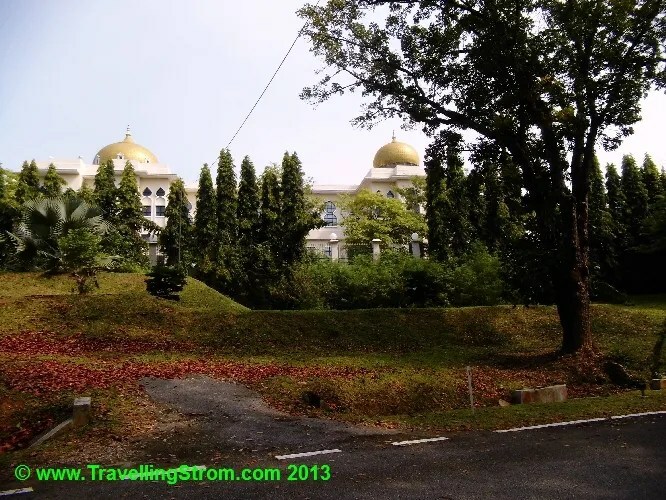 Located at Bukit Chandan in Kuala Kangsar, the resplendent Iskandariah Palace is the official residence of the Sultan of Perak, Sultan Azlan Shah. Surrounded by lush greenery, this palace sprawls majestically across verdant gardens. Reflecting a strong Moorish influence in its architecture, the pristine cream coloured palace displays the characteristic golden domes of this fashion. Not accessible to the public, visitors can view a replica of the Balai Rong Seri, its regal ceremonial function hall at the Sultan Azlan Shah Gallery, which is located nearby the Iskandariah Palace. Recently, a banquet hall and another ceremonial function hall were added. Cache is a small cylindrical screw-capped transparent plastic bottle wrapped in black polyethylene bag for protection against the elements. BYOP to log your visit. 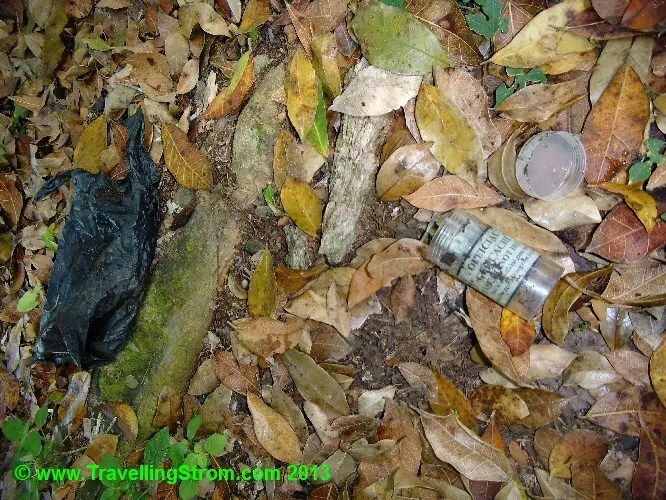 Cache is located about 1 meter from ground level stashed in a hollow of a tree. Well, I could not see too much of the palace and I also could not find the cache. I checked this tree inside out to no avail, it was missing, although I did find a bit of shredded plastic, which may have been used to protect it. There were only actually 3 hidey holes at 1.5m above ground, but I checked from the ground up to as high as I could reach. Bummer! 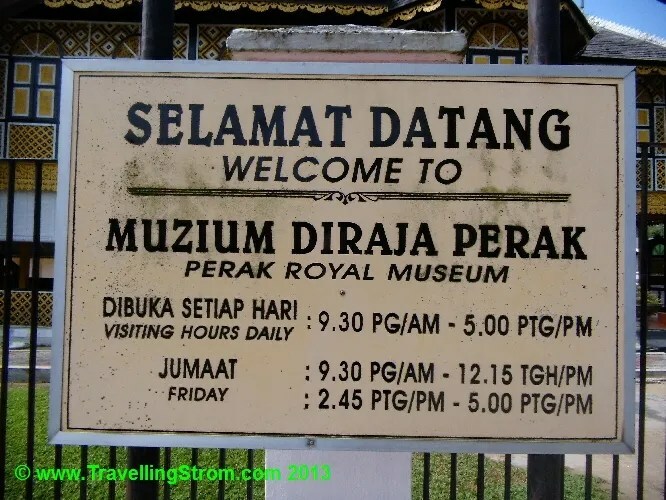 Just next to the Iskandriah Palace in Kuala Kangsar lies the Royal Museum. This architectural masterpiece was built entirely without any plans or nails. 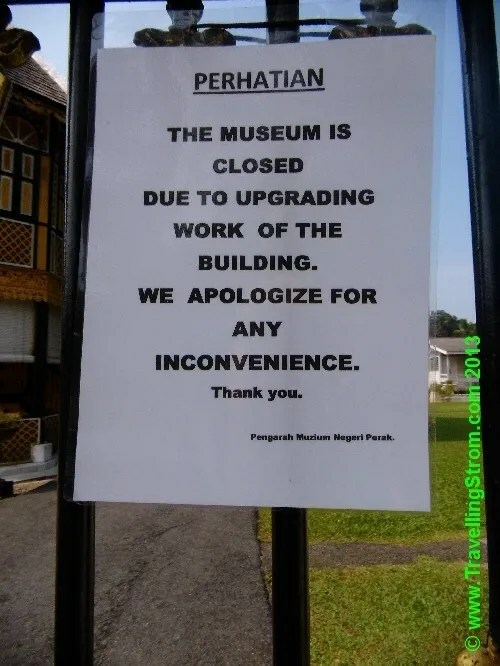 Solid wood was used to build to the palace with the exception of the roof that was built using the waterproof kayu berlian or diamond wood. 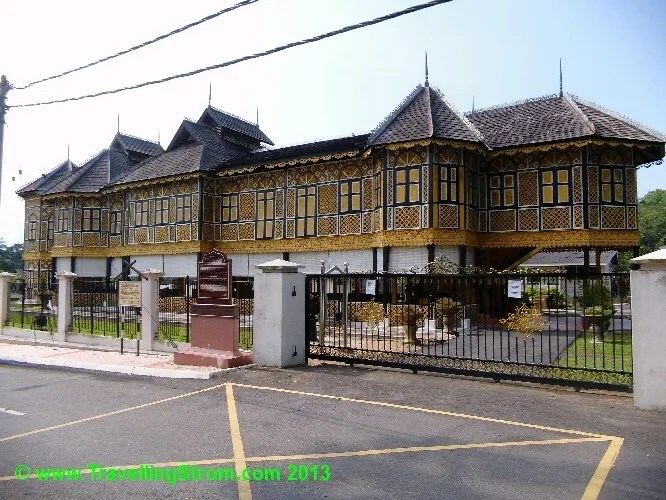 In true patriotic fashion, the palace was painted in the three official colours of the Perak flag – white, yellow and black that represent the three branches of the royal family. Woven sliced bertam or bamboo with diamond shaped motifs line the inner palace walls. Also particularly unique are the doors at the top of its stairs, which are set horizontally rather than vertically. Cache is a small cylindrical screw-capped transparent plastic bottle wrapped in black polyethylene bag for protection against the elements. BYOP to log your visit. 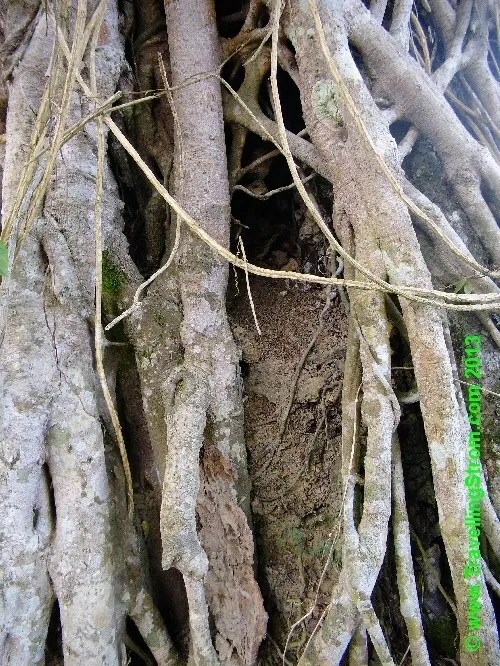 Cache is located about 1.5 meters above ground level stashed in a hollow of a tree. 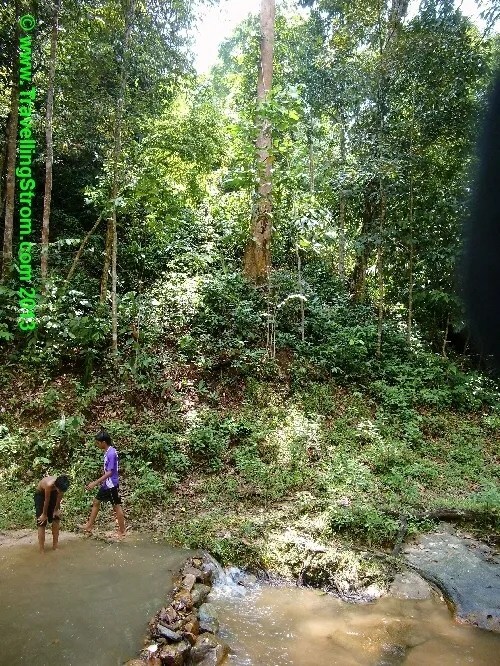 I headed back now to Papan as I wanted to look for that FTF cache again, I had some ideas. On the way back while riding the highway, I stopped to take some photos of the bike friendly main roads department. 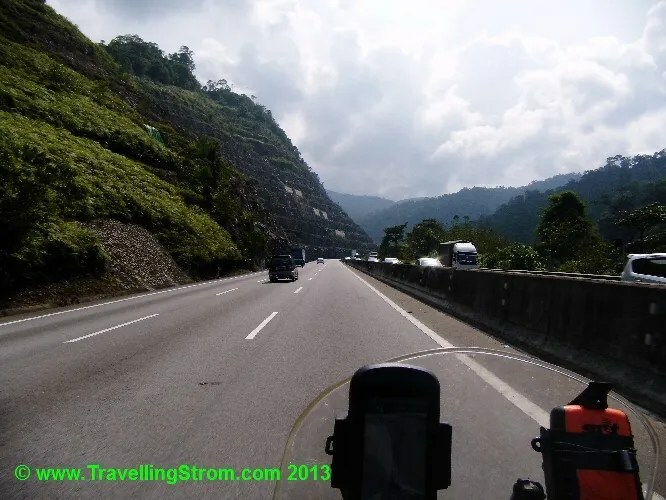 This country is so hip with motorbikes that it is FREE for all tolls on any road and freeway, like it should be back home. But also, they provide regular safe places for bikes to stop and don the rain gear. 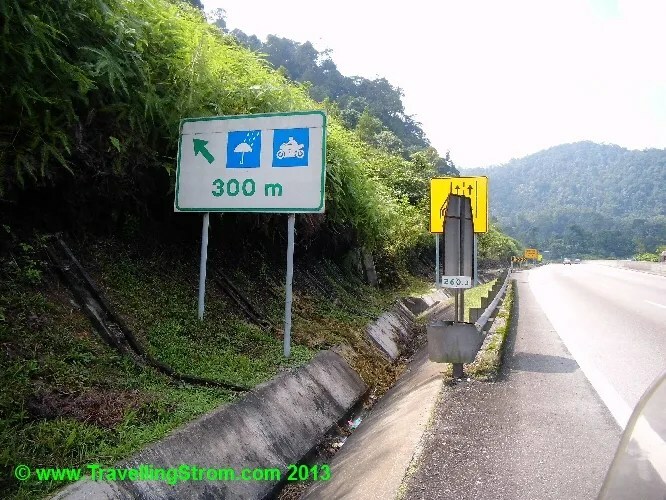 This version on the main interstate was very elaborate, there is a small turn off to a small shelter where you put the wets on, or wait out the rain, then a small track back to the highway. This is a brilliant idea and I would like to see some of these back home, I may start to petition my local member, Kirstin. 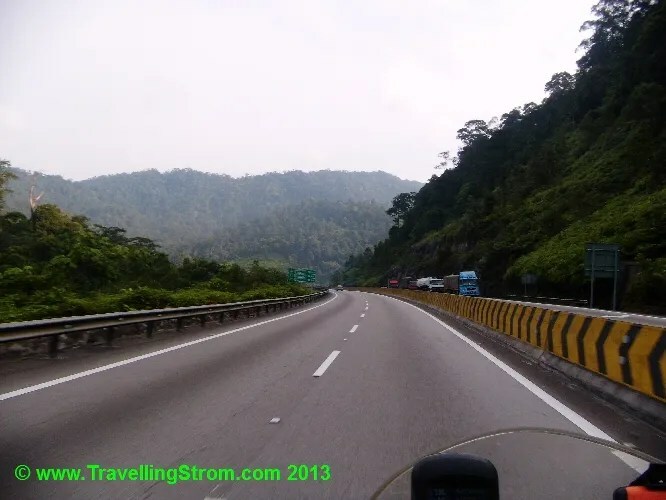 As I mentioned, these are on the interstate, on the main highways and larger rural roads where the road passes under a bridge, they have a barrier system. In Oz, when we stop under bridges we are in a dangerous place due to the lack of visibility and protection from out of control cars. 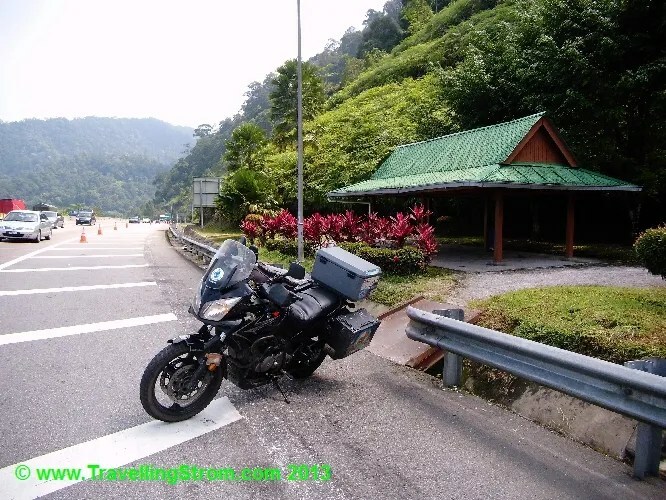 What they do here is put a barrier along the breakdown lane next to the road and this has a gap in either end to bring your bike behind the barrier and to get out again. 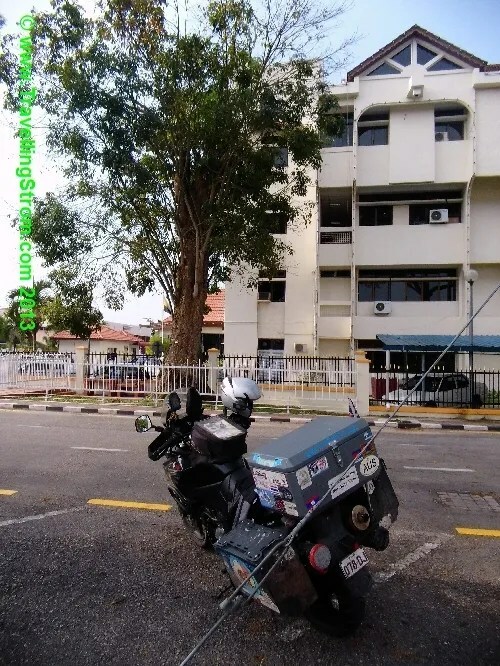 A simple but efficient and safe system 🙂 I will try and get photos next time I see one, another innovation to pass onto main roads back home, anything to make riding the road safer for everyone. 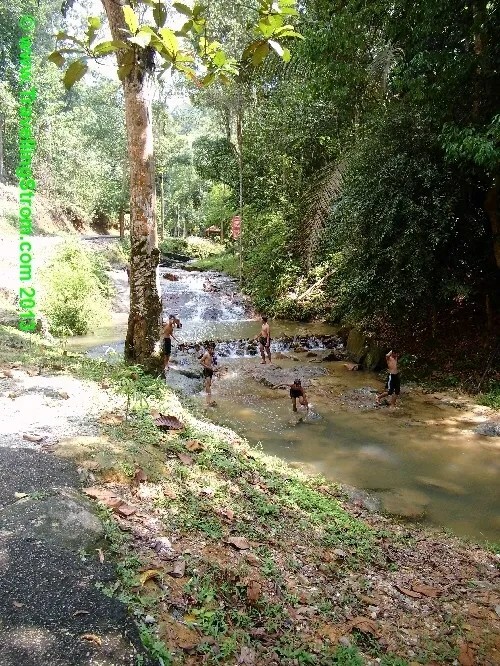 It was very hot and muggy when I got to the Papan Cascades cache that I had been to yesterday and unlucky for me there was a group of kids here swimming and having fun right on top of GZ! While I was chatting to the kids I happened to spot a tree that looked remarkably like the one in the description of the cache. It was not until I got home about 20 minutes later that I could compare them, but on review, I reckon I have found the actual tree the cache is hidden behind. 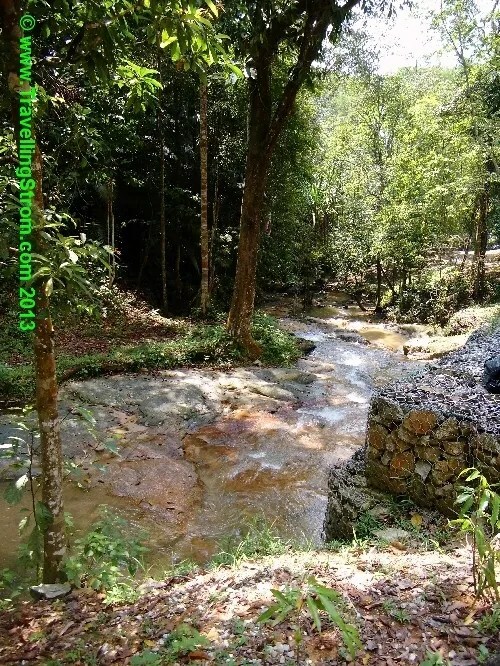 But, it is about 20m away from the co-ords supplied and up the hill on the other side of the creek, so it looks like if I want this one, I have to return yet again!!! 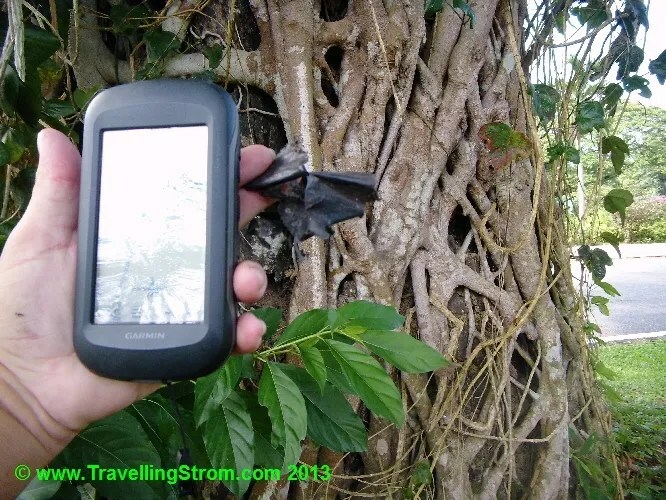 The first picture here is my photo of the tree I think is it and the second is the one from the Geocaching website, what do you reckon, a match or what? So the rest of the day was spent relaxing and sorting some bike stuff out as I needed to work out when I was going to fly home. 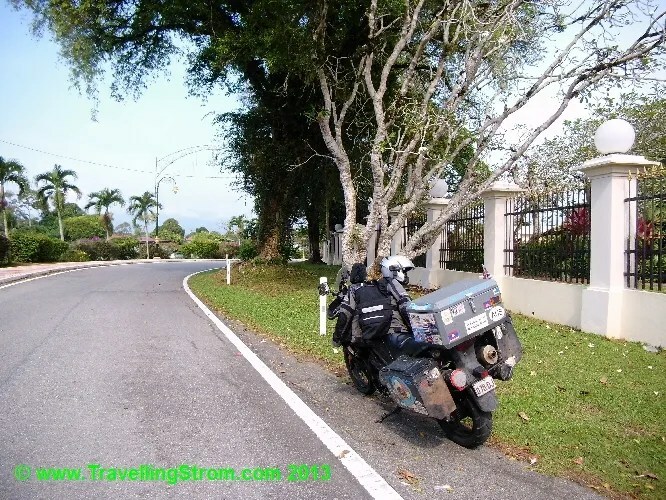 Well, as it turns out when I called MasCargo, they said I can fly direct to Brisbane and I must book a week in advance, so I right away booked an Air Way Bill number and booked the bike on a plane leaving next Monday out of Kuala Lumpar. I then searched and found a seat on the same plane and booked a ticked for myself. 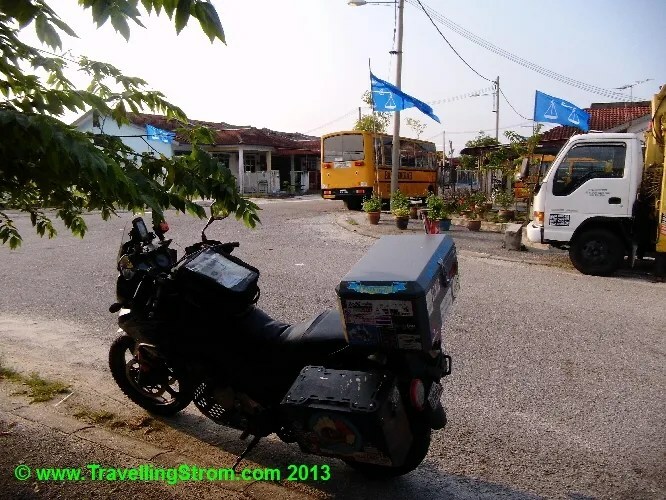 So, all going well, I needed to be packed and cleaned by Sunday to deliver the bike to customs, then arrive at the airport Monday at 7am for my check in. 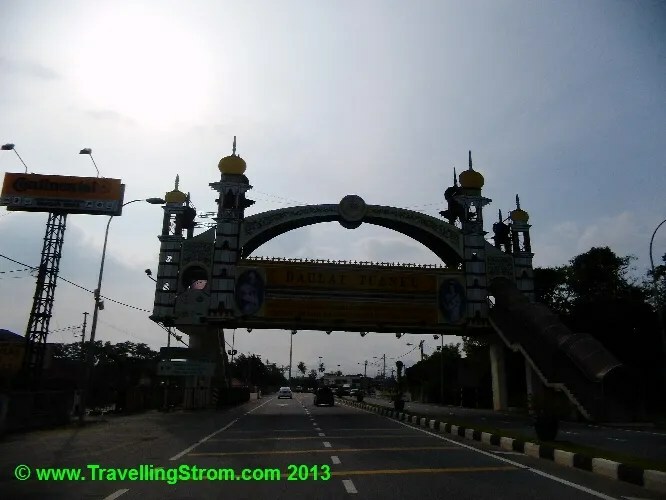 This entry was posted on March 25, 2013 at 12:10	and is filed under Around The World, Eurasia. You can follow any responses to this entry through the RSS 2.0 feed. You can leave a response, or trackback from your own site. 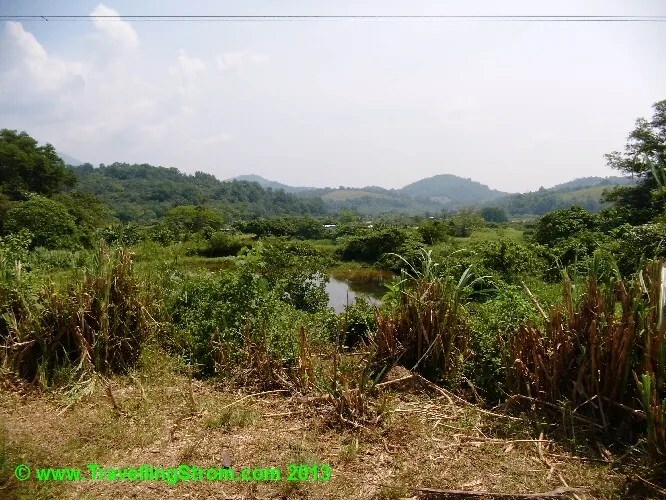 I am glad you did some glimpses of Malaysia in real life. 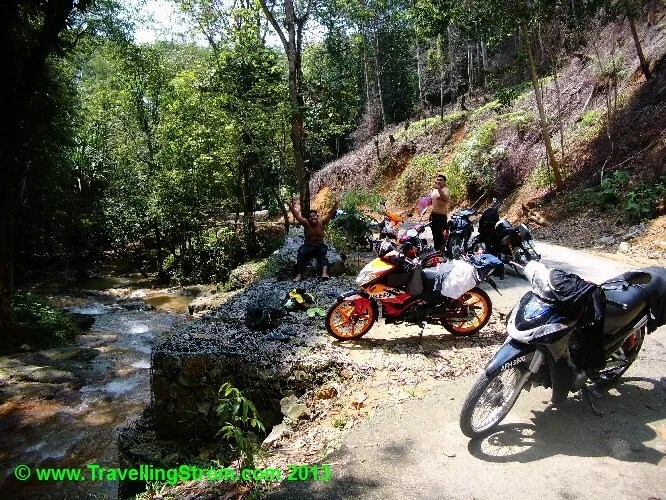 The fact remained that country folks anywhere in our traveling places are basic, simple and friendly. I wish my plan is up to mark for Australia ride next year. Cheers from Batu Gajah.